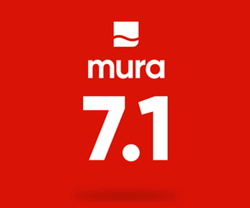 Mura, a leading Digital Experience Platform, today announced that it has released Mura 7.1, the latest version which brings new functionality, flexibility and agility to digital experiences for organizations of all sizes. Key components of Mura 7.1 include a containerized, Docker-First approach to architecture, API-led development, continuous deployment, and immutable infrastructure. But Mura 7.1 isn’t just for developers, it’s also GDPR-friendly, with the ability to easily allow consent and for users to have their history removed, complying with the new EU legislation. Named as a High Performer in the web content management category on G2 Crowd for the past five consecutive quarters, Mura earns strong customer satisfaction marks across all business sizes including enterprise, mid-market and small businesses. Customer reviews include accolades such as, “Powerful and flexible CMS”, “The best CMS I have ever used”, and “Mura is very simple to use yet super powerful.” Mura has received a 4.5 out of 5 stars in user satisfaction based on 75 real user reviews. Headquartered in Sacramento, CA, Blueriver is a leading provider of agile digital experience solutions for medium to large organizations. The Mura Digital Experience Platform addresses a critical business need to create, manage and deliver content to multiple channels, applications and devices, connect experiences, as well as measure content’s contribution to the business. Mura is a modern platform that gives developers, product managers, and marketers the power to manage their digital experience, freeing them from digital angst.